I love a good foodie event; whether it’s one of the big ones like the Cake and Bake Show or the Good Food Show or a small food festival like we have in Otley each year; I can easily spend hours browsing the stalls and watching demonstrations take place. I won’t even go into how much money I can spend, all I know is I have to be very restrained. One of the shows I have been to twice now is the Cake and Bake Show in Manchester. I went 2 years ago for the first time with Mr T and last year I was helping out on the Clandestine Cake Club stall where I was very fortunate in getting to meet some of my foodie idols. This year I’m very excited to hear that the show is coming to Harrogate which is only 20mins away from me and I’m already planning what I want to do when I’m there. Top of the list is inspiration for the wedding cake! I could ramble on about how much I like the show but you can read my previous posts here where you will see all manner of cakes and baking. 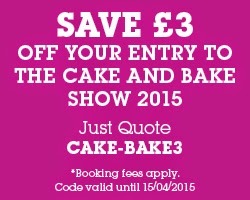 “The Cake & Bake Show, in association with NEFF is an experiential live event for baking and cake fanatics. The event is set to turn up the heat with 4 new exciting shows in Harrogate, London, Manchester and Edinburgh. These events have capitalised on the popularity of all things baking and host the perfect mix of live demonstrations, expert classes, market stands, live competitions and so much more to develop your home baking hobby! Remember this ticket code is only valid until the 15th April; get yours before the offer expires.